There's no harnessing Ole Man River - floods last year and a drought this summer . 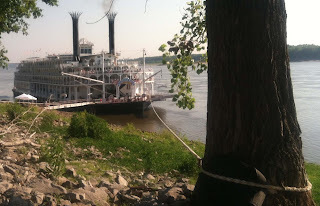 Two weeks ago the American Queen was forced to tie up to a tree on Mud Island. Yesterday the new Beale Street Landing floating dock had to be disassembled and moved to the Cobblestone Landing. But just as you start to feel sorry for the RDC, something like the multi-colored topper pops up.